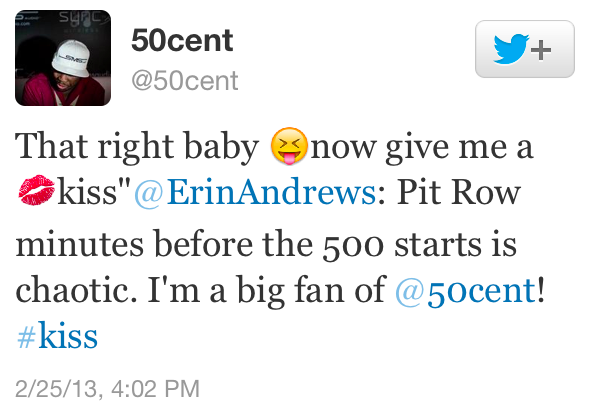 50 Cent showed up at this weekend’s Daytona 500. Seems harmless enough, right? Just horrible. Sorry, Erin Andrews. But nothing truly compares to that 50 Cent instructional video on how to not approach a woman and kiss her. He’s like the Tom Emanski of never getting a second date. As someone who has been on Team Cheek Kiss since 2007, I’m well aware of the possibility for awkwardness, but I also have a firm grasp of when, to whom, where, and for how long. Curtis Jackson has no idea what he’s doing out there. Or, on the surface, it seems as if he doesn’t. You know, just an amateur flirtatious move by a man nervously out of his element. That’s what appears to be happening, at least, until you dig a little bit into the history of Curtis Jackson and kissing. Again, another seemingly harmless 50 Cent appearance, this time on Saturday Night Live to perform “Candy Shop” and “Disco Inferno.” But then, just when you think it’s not bad, Curtis realizes he’s being televised, without a chaperone (no, Tony Yayo doesn’t count), within arm’s reach of a woman he doesn’t really know, and then can’t help himself. Bad, right? Well, this is actually deceiving, because it’s MUCH worse. YOU THINK WE’RE NOT ON TO YOU, CURTIS? YOU THOUGHT IF YOU GAVE IT EIGHT YEARS, WE’D JUST PRETEND LIKE SWANKGATE NEVER HAPPENED? Nope. I didn’t forget. And if I had to guess someone else who hasn’t, it’s Hilary Swank. Count your blessings, Erin Andrews.